This site has a great combination of flirty fun mixed with a determination to find a serious partner. With uDate.com, you can send a suggestive “flirt” while at the same time using the “Today’s Matches” suggestions to find someone special. There are plenty of other useful tools too, such as instant profile alerts of users you are interested in. In fact, one of the features uDate.com has, is the terminology – Interactions with other users are known as “Encounters.” Usefully, you can browse your encounters history and check how other users found you, helping you plot how to improve your own profile or activity in order to attract more attention. Meanwhile, the favorites list lets you keep track of the users who catch your eye. The profile alerts on your dashboard also help you keep up to date with potential matches. Getting started is simple. You will be asked to submit some very basic information. First of all, you will need to state your gender, followed by e-mail address, a password and date of birth. 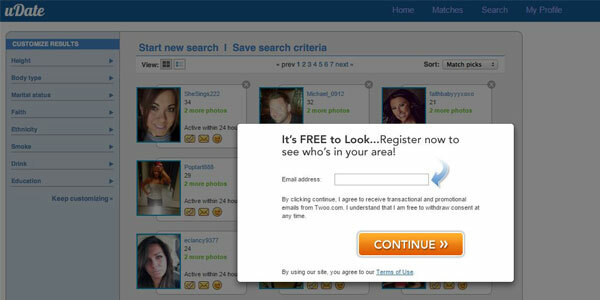 You will be sent an e-mail in order to verify your account and then you are free to browse and create a profile. It is worth taking your time over this, as the information you include in your profile largely determines the automatic matches you will receive. Importantly, the uDate dating site profile includes what you are not looking for in addition to what you are hoping to find in a match. Safety is understandably a concern for many online users in general. However, the e-mail verification on sign up is an excellent step which helps to eliminate potential scammers. In addition, there is a safety tips page which gives useful advice on issues such as scam awareness and the intricacies of meeting up with someone offline. It is a useful helping hand and a real sign that safety and security is taken seriously at uDate.com. Free members are welcome. However, their usability is somewhat restricted as the full range of communications tools is only open to paid members. So, if you really are serious about meeting someone, we recommend considering a membership package. Or at least the free 3-day trial to get a feel for the site. For a single month, the cost is $24.95, while a 3-month deal works out at a monthly cost of $16.65 while a 6-month package will set you back just $12.49. Nothing is too complicated at uDate.com. However, that doesn’t mean that this is a basic site, far from it. This is a lean production, which has just the right amount of features to hold your interest without becoming overwhelming. There are all sorts of design features to simplify uDate.com’s usability. So, you can see when a user last logged in, if they read a message you sent or if they viewed a photo you uploaded. Meanwhile, as you construct a profile, you can specify whether you are looking for friendship, a romantic or intimate encounter. It’s a simple distinction, but will help the site provide more effective matches. This is probably the defining feature for most dating sites. Is the search function actually likely to work? Well, at uDate.com it will give you a pretty good chance to find someone. The “Today’s Matches” feature will suggest five possible matches each day. These will be based on the information you have already provided to the site and so it should be a reflection of what you are looking for. Of course, you can take a more proactive approach too and conduct a search yourself. You can look for someone using broad criteria such as distance, who is online now and new members. Or, you can add some more customized search terms including faith, body type and attitudes towards smoking and drinking. This uDate review can only conclude that this is an excellent all-round dating site. Serious daters might want something more wholly dedicated to long-term partnerships. If so, then check out our review of the impressive EliteSingles.com. However, uDate.com has just the right mix to make it a winner for everyone, whether you are looking for casual fun or the love of your life. There is also a great balance of features and practicality. This is just about the most solid general dating production you will find.